To keep up with the rapid advances in high-speed interfaces, you need to be able to run accurate, full-bus simulations in hours, instead of days. 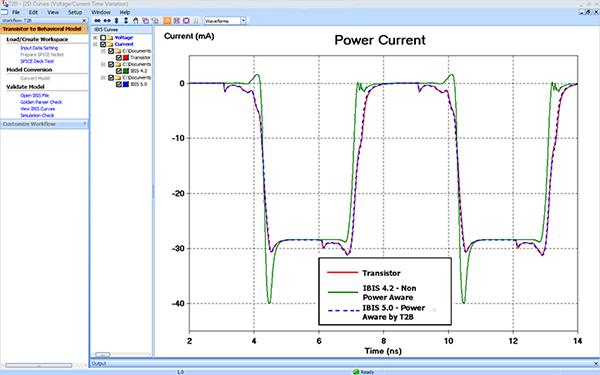 By converting models from transistor to power-aware IBIS behavioral, Cadence® Sigrity™ Transistor-to-Behavioral Model Conversion (T2B™) can help you meet ever-shorter deadlines by avoiding time-consuming transistor-level simulation and inaccurate non-power-aware IBIS model simulation. 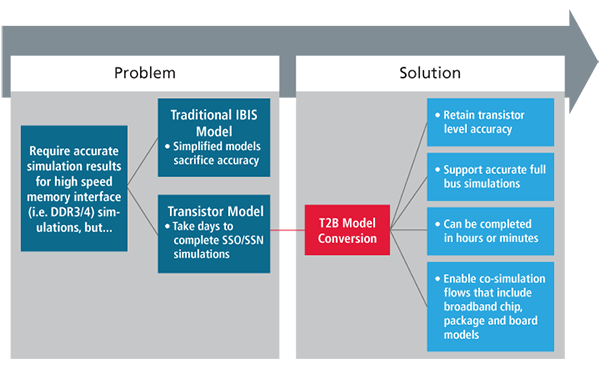 Along with saving you time, the Sigrity T2B solution preserves co-simulation flows that include broadband chip, package and flow models, by giving you output models in IBIS 3.2, 4.2, 5.0, and 6.0 formats, as well as in an accuracy-enhanced Sigrity behavioral model format. Also, the power-aware behavioral driver models generated by the Sigrity T2B solution further ensure accuracy and support highly efficient simulations using Sigrity SPEED 2000™ and Sigrity System SI™ technology, or other compatible simulators such as Spectre® and HSPICE.